Hey Shon, one of the best articles I've ever read on serratus function and activation. No exaggeration. I just discovered handstand shrugs as an excellent upper trap/serratus integration. Thanks again Shon. This info is so valuable. Awesome stuff. It can be implemented with the other lower traps blog so well. It's helping with my shoulder issues dramatically. Please keep p this series of shoulder info. Would love one on assessments. I have very depressed shoulders. Missing so much range from hanging so low. Noone ever picks up on it and I fell victim to the shoulders "back and down" like "everyone should" but the cue made it worse for me than improving movement and pain symptoms. Great stuff Shon. I love the progression and the handstand shrugs. 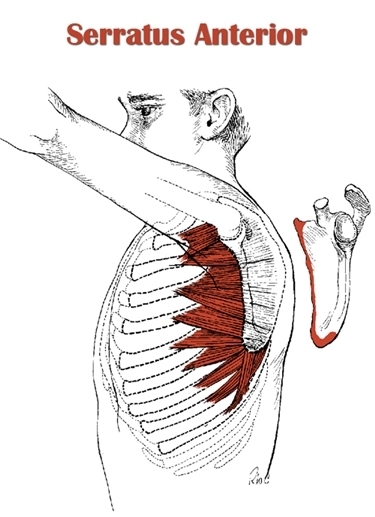 I prefer to face the wall as it seems to target serratus better w less lats, at least it feels that way to me. Keep up the terrific writing!